Good evening ladies! 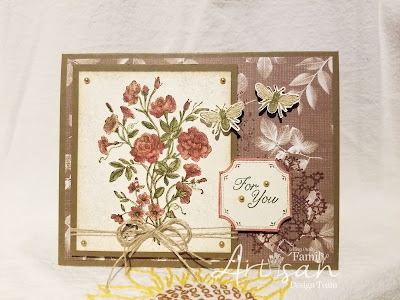 I just received my shipment with the stamp set I will be using for Artisan next week, and I thought I would just start it today, but I DID say would make two cards with this set. 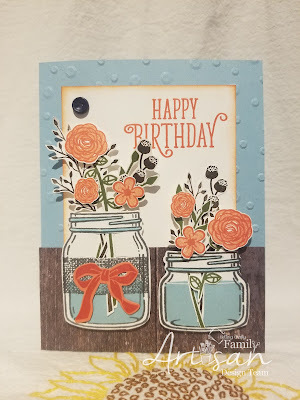 I absolutely LOVE, LOVE, LOVE this card I created tonight. Do you SEE all the shine of copper? The layered effect of copper embossed image on vellum over a different stamped image... the copper running through the ribbon. This could be a wedding card! 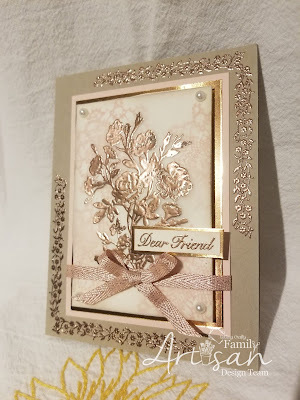 Tip: you CAN heat emboss vellum... so add that extra layer to your cards!